And is it true Seattle can play only Dallas or Chicago in the Wild Card round of the playoffs? You’ve got questions in the wake of the Seahawks’ win over Kansas City to clinch a playoff berth and then Pete Carroll’s contract extension the next day? Here is our attempt at some answers. 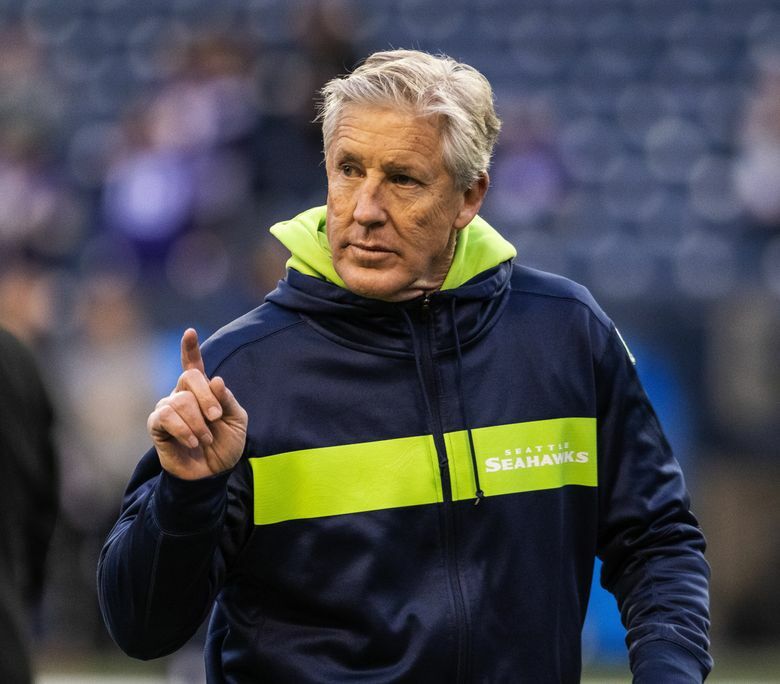 Q: What does Pete Carroll’s contract extension through the 2021 season say about the immediate future of the franchise? A: It seems to indicate strongly not to expect a sale anytime soon. In the wake of Paul Allen’s death in October, the obvious question was to wonder if the team would soon be sold. Those rumblings increased when it was revealed in November that plans had already been made that any proceeds from the team would go to Allen’s foundation. But just because those plans had been made doesn’t mean a sale is imminent. Indications, in fact, are that the team is not currently for sale with Allen’s sister, Jody — running things since Allen’s death — is dealing first with other more urgent matters relating to Allen’s estate and is fine to leave the Sehawks as is for a while. The Seahawks are thought valued in the $2.7 billion range, roughly a 10th of Allen’s holdings. But that value will only go up, the team is in good shape and running smoothly with Allen’s confidant, Bert Kolde, keeping a closer-than-ever watch on things, and it appears everyone is fine with the status quo for a while. Carroll didn’t want to go into detail about anything related to the ownership other than to say he had no concerns about it. But Carroll saying he is “excited about what has happened with ownership’’ seemed to speak loudly enough. Indications are that’s a full title she could hold for a while. Q: The Seahawks are just going to have to go to Dallas for the wild-card round of the playoffs, right? Recall that all that has to happen for the Seahawks to play at Dallas in the opening round of the playoffs is beat Arizona on Sunday. Seattle was an initial 11-point favorite and the Cardinals are running on fumes, so…. Dallas is locked in as the No. 4 seed in the NFC and Seattle will be the five as long as it beats Arizona. Also worth noting is that Seattle can play only Dallas and Chicago in the wild-card round (here’s an official breakdown from the NFL). If Seattle loses to Arizona, then Minnesota could become the five if it beats the Bears. In terms of Seattle’s seeding it is irrelevant what the Eagles do. Seattle holds a conference games tiebreaker on the Eagles, so if Seattle and Philly each finish 9-7 and the Eagles make the playoffs, then the Seahawks are the fifth seed. The only way Seattle can fall to being the six is for the Vikings to beat the Bears and become the five seed. But in that scenario then the Rams would be assured of being the No. 2 seed since the Bears would have lost. Basically, the easiest way to think of it is that Seattle is the five if it wins, and the six if it loses and Minnesota wins. Nothing else really matters. True, Arizona has beaten Seattle the past three years at CenturyLink and the Seahawks could decide to rest some players. But Arizona is not a good team and Carroll seems determined to win the game. If so, then pack your bags to Dallas. Q: The final two opponents of Seattle’s 2019 schedule will be determined by the results of this weekend, correct? A: Actually, it’s already set. Recall that 14 of the 16 opponents for any NFL team are predetermined via the league’s scheduling formula. In 2019, Seattle will again play six games against its three NFC West foes, each home and home — Arizona, Los Angeles, San Francisco. NFC West teams next year also play the NFC South and the AFC North, rotating home-and-home based on which team was home the last time. For Seattle, that means home games against New Orleans, Tampa Bay, Baltimore and Cincinnati and road games against Atlanta, Carolina (yep, them again), Cleveland and Pittsburgh. Seattle also has games against the same-place finishers in the NFC North (at home) and NFC East (on the road) — or, the team that ends up second place in each of those divisions. And it turns out, those are already set — Minnesota and Philadelphia. The Vikings are secure in second in the North. And while the Eagles and Washington can tie for second in the NFC East if Washington wins Sunday, the Eagles would win tiebreakers to be second place (it would go down to the third tiebreaker of won-lost percentage in common games, and the Eagles will have the edge no matter what happens Sunday.) So that means a trip again for Seattle to the City of Brotherly Love. Q: Why did the Seahawks sign Bo Scarbrough last week and then not have him active for the game against the Chiefs? A: The Seahawks signed Scarbrough, a rookie running back out of Alabama, off Jacksonville’s practice squad last week but he was then one of Seattle’s seven inactives for Sunday’s game against Kansas City. But remember that Carroll said the signing was done to assure the team has enough running-back depth with Rashaad Penny nursing a knee injury that has held him out the past two weeks and after seeing both Chris Carson and Mike Davis get banged up a little bit (but without having to leave the game for any length of time) against the 49ers. Also, Scarbrough said that Jacksonville had also offered to put him on its 53-man roster last week. So it sounds like if Seattle wanted Scarbrough — a player the Seahawks had scouted heavily before the draft — it was last week or never, in terms of adding him for this year, anyway. The Seahawks at that point also knew their chances of making the playoffs were pretty good, and with the style they are using on offense are always going to want to make sure they have three healthy and ready-to-go-tailbacks. Signing Scarbourgh last week allowed him a few weeks to get acclimated to the playbook and all that in case he is needed for the playoffs. Seattle also knew of a scenario that has now come true — it could clinch a playoff spot before the final regular-season game against Arizona. While Carroll said he doesn’t plan to go into the game with the idea of resting anyone — and NFL rosters mean only 43 nonspecialist players suit up on game day, anyway, limiting the options — one player you’d expect to probably get most or all of the day off is Carson, who has had 27, 22 and 22 carries the past three weeks after having more than 19 only twice in the first 12 games of the season. Penny might be back, but you’d figure the Seahawks will err on the side of caution with its top tailbacks, meaning it won’t be a surprise to see Scarbrough — who has yet to play in an NFL game — get a few carries Sunday against Arizona.